A gong immersion or gong bath is ideal for anyone who wants to experience a deeply relaxed and rejuvenated state. Particularly beneficial for those suffering from stress, anxiety, insomnia, neck pain, headaches, tinnitus, respiratory problems, nerve damage or injured joints. The gong is thought to be as old as the bronze age and has been used, particularly in the east, for ceremonial and ritual purposes. The gong belongs to the idiophone group of instruments, which means it makes its sound from its own vibrations. The gongs used in our sessions are made by the company, Paiste, who are regarded as the world’s leading manufacturer of gongs. The gongs are handmade, so no two are quite the same. We now live in a constant heightened state due to our busy lifestyles and relentless notifications and social media surfing. This puts the body under excessive stress. We are quickly losing the ability to naturally enter a relaxed state, leading to increasing rates of stress and anxiety and concurrent ailments caused by the dis-ease of our bodies. The gong works on all levels to heal and transform the body and mind. It produces strong sound waves which stimulate the physical body, increasing circulation, and affecting dermatomes on the skin producing a massage effect on corresponding organs and other areas of the body. The brain tunes in and is captivated by the gong sounds causing the brainwaves to become slower. This enables the listener to enter a deep state of relaxation where theta brainwaves may be produced. The gong tones vibrate and harmonise the cells of the body to function at the optimum level and encourage healing, which can be defined as the restoration of the natural balance and flow of energy on all levels of existence; physical, mental, emotional and spiritual. Healing is also about change – the changing of old thoughts, habits, patterns of behaviour that no longer serve the individual. As a powerful stimulant, the sound of the gong helps retrain our nervous system functioning by deliberately creating heightened states during play, followed by periods of deep relaxation to retrain our ability to enter into this state naturally. A gong immersion or gong bath session begins with either yoga asana practice or a series of relaxation techniques designed to open the flow of energy and create a body-mind state for change and healing. Once in this receptive state, the sound of the gong is used to create an extended state of meditation and therapeutic relaxation that moves energy in the body for healing. 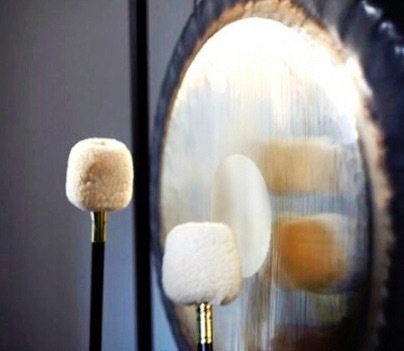 Because it affects the emotional sheath of the body, the sound of the gong can bring about various emotional releases, especially when heard the first several times. Crying or laughing may be common, as well as transient anxiety, fear, love or bliss as emotional reorganisation is brought about by the sound of the gong. Ideally the listener remains both relaxed and aware, so the mind and emotions can achieve clarity. The more relaxed and open you are, the more effective the gong sounds will be. Thoughts may drift in and out of your mind during the session, which is quite normal. These may be sub-conscious thoughts that we need to let go of as part of the cleansing and rejuvenation process. Time can pass quickly, it is common for listeners to feel only 5 or 10 minutes has passed when its actually been more like 45 minutes. The silence at the end of the gong playing is as important as the gong sounds themselves and will last a few minutes to enable the ‘shunyata’ to linger a little while longer. This silence is full and intense and there should be no rush to come out of this state. You will slowly be brought back into the body and reality of the room by the voice of the teacher, who will also take you through a short series of deep breaths, small movements and stretching. You will be reminded of any intentions you may have set for yourself as the session is brought to a close with some final words. You may feel a little spacey and it may take a few minutes to ‘re-ground’. You may not wish (or even be able) to talk in the first few minutes as the gongs will have taken you into the right hemisphere of the brain. Some light refreshments will be provided to enable you to return to a fully-functioning state before you leave. During this time, you may wish to share your experience with others, but it is equally fine if you want to keep the experience to yourself. Most people leave feeling very calm, peaceful and rejuvenated and able to cope with everyday life more effectively. You will probably sleep very well the night after the gong immersion, even if you usually suffer from insomnia. Its preferable not to have a full stomach as this may cause discomfort when you’re lying down. Do not drink alcohol or use recreational drugs, the energies of these may cause unwanted effects. Bring some water and use the toilet before you take your spot. Bring a cushion and one or two blankets to ensure you are both warm and comfortable to aid relaxation. It is preferable to spend the rest of the day/evening in a soothing environment where you can continue to relax, either in a bath, or by reading or listening to some harmonious music. Drink plenty of water for the next few days to help the kidneys flush any toxins out of the system.